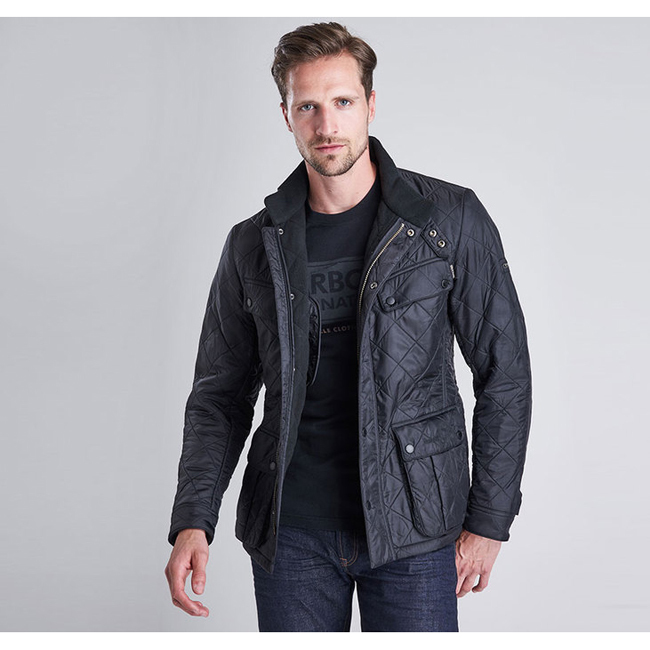 Built for the open road yet stylish enough for the city, the Ariel Polarquilt is a tailored men's quilted jacket. We recommend you size up to wear with layers. Inspired by Barbour's rich motorcycling heritage, this quilted jacket is constructed in Barbour's signature Polarquilt combination for exceptional warmth. The tough polyamide outer is quilted to an insulating Polarfleece lining, with the iconic diamond design adding unmistakable authenticity. Featuring a funnel collar complete with stud-fastening strap, a two-way front zip and studded storm fly front, this robust jacket is well-equipped to protect against draughts, wind and rain. Staying true to its roots, the Ariel Polarquilt showcases the classic four-pocket detail typical of biker jackets, trimmed with subtle Barbour branding and offering plenty of practical pocket space to help to keep valuables safe and hands free. Available in choice of five easy-to-wear colours.